For the village in Syria, see al-Hafar, Syria. 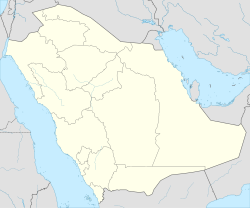 Hafar Al-Batin (Arabic: حفر الباطن‎ Ḥafar al-Bāṭin), also frequently spelled Hafr Al-Batin, is a Saudi Arabian city in the Eastern Province. It is located 430 km north of Riyadh, 94.2 km from the Kuwait border, and about 74.3 from the Iraq border. The city lies in the dry valley of the Wadi al-Batin, which is part of the longer valley of the river Wadi al-Rummah (now dry), which leads inland toward Medina and formerly emptied into the Persian Gulf. In the 1st century after hijrah or 638 CE, Hafar Al-Batin was just a route in the desert that pilgrims passed through traveling to Mecca for Hajj. At that time, there was no water available in this land, so the pilgrims travelled from Iraq to Mecca on a long route without water. During the reign of Uthman (644 - 656 CE), many pilgrims complained about the lack of water, and Abu-Musa al-Asha'ari, a companion of the Islamic prophet Muhammad responded by digging new wells along the route in the Al-Batin valley. The name of Hafar Al-Batin (Arabic: حفر الباطن‎, "the hole of Al-Batin Valley") is derived from this. All the downtown roads of Hafar Al-Batin are paved. It is connected with an international network of roads, connecting Saudi Arabia with Kuwait in the East and connecting the North with the Eastern Province. Hafar Al-Batin has two airports, Qaisumah (IATA: AQI, ICAO: OEPA) airport about 20 km in the southeast, and King Khaled Military City Airport (IATA: KMC, ICAO: OEKK) about 70 km in the southwest. 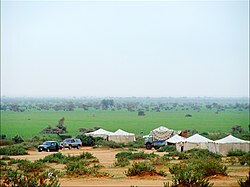 The weather in Hafar Al-Batin ranges from −2–8 °C (28–46 °F) in winter nights to 40–50 °C (104–122 °F) during summer days. The climate in general is hot and dry, and it rains only during winter months. ^ "Climate: Hafar Al-Batin - Climate graph, Temperature graph, Climate table". Climate-Data.org. Retrieved 2014-02-23. ^ "Climate Data for Saudi Arabia". Jeddah Regional Climate Center. Retrieved December 7, 2015. Wikimedia Commons has media related to Hafar Al-Batin.